I attended a classical, elegant wedding at Villa Antonia this past weekend. 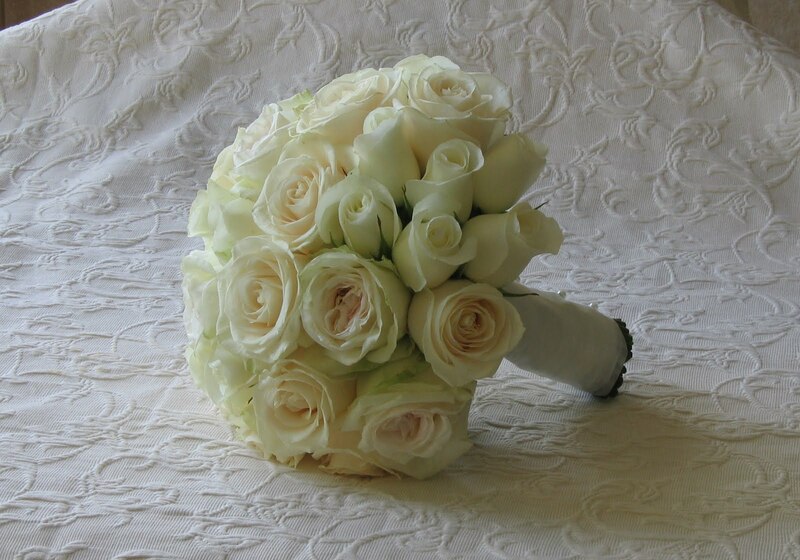 The beautiful, blissfully happy bride wore white with sheer organza ruffles and carried white & cream roses/garden roses while her bridesmaids wore cute, black cocktail dresses and carried red roses with green leaf accent. Adorable flower girls dressed in tulle sprinkled petals down the aisle. The guys looked very Bond in black tuxes with either white or red boutonnieres. Decor: The ceremony arbor was swagged and draped with white chiffon, further complemented by a white aisle runner. White chairs sporting black chair ties awaited guests. 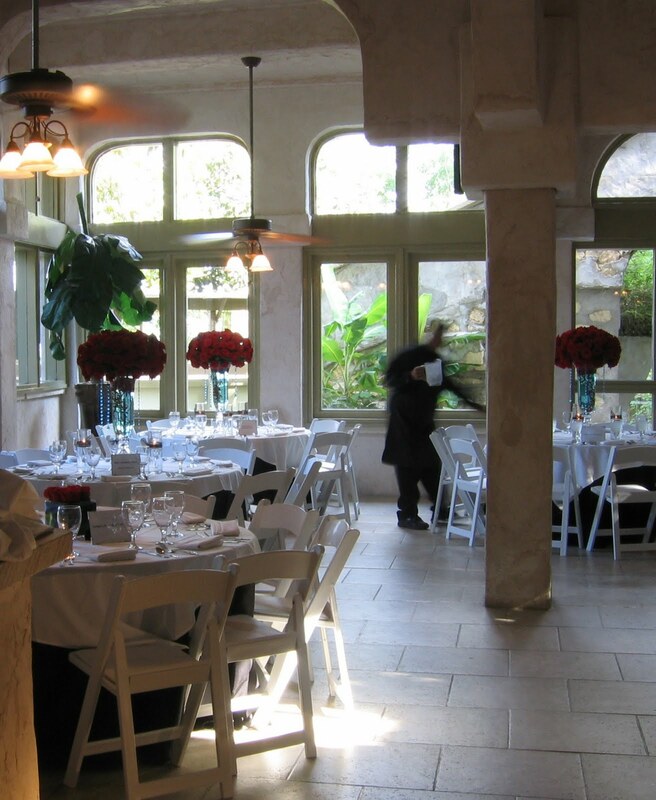 Inside the Italianate villa, the decor was refined and elegant. 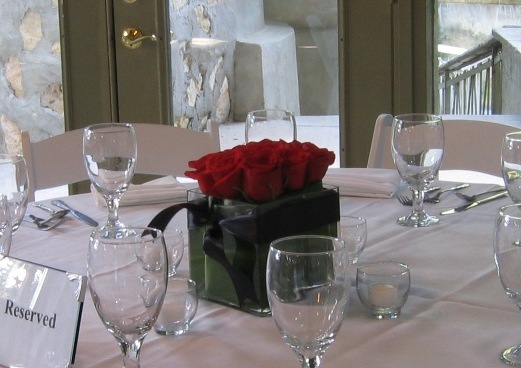 Tables wore black linens with white toppers and were graced with three different centerpieces. 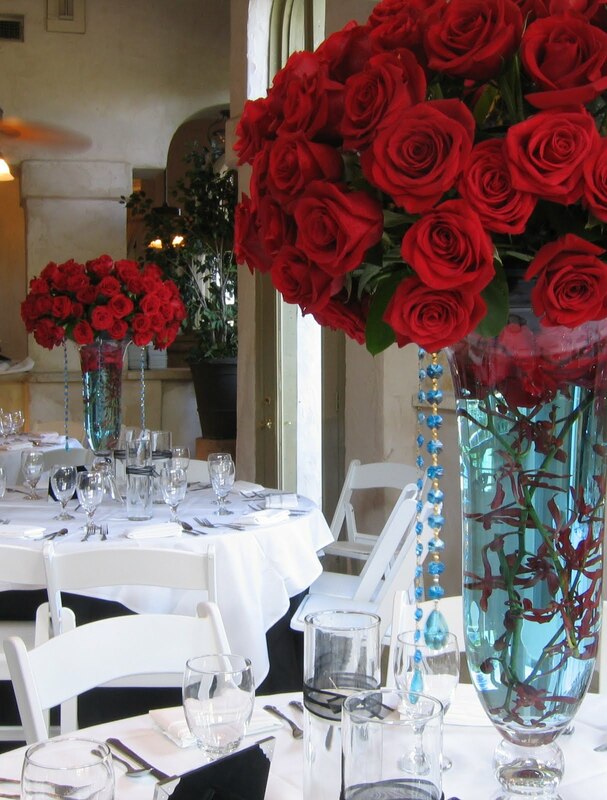 The first was a gorgeous tall arrangement of almost one hundred red roses. 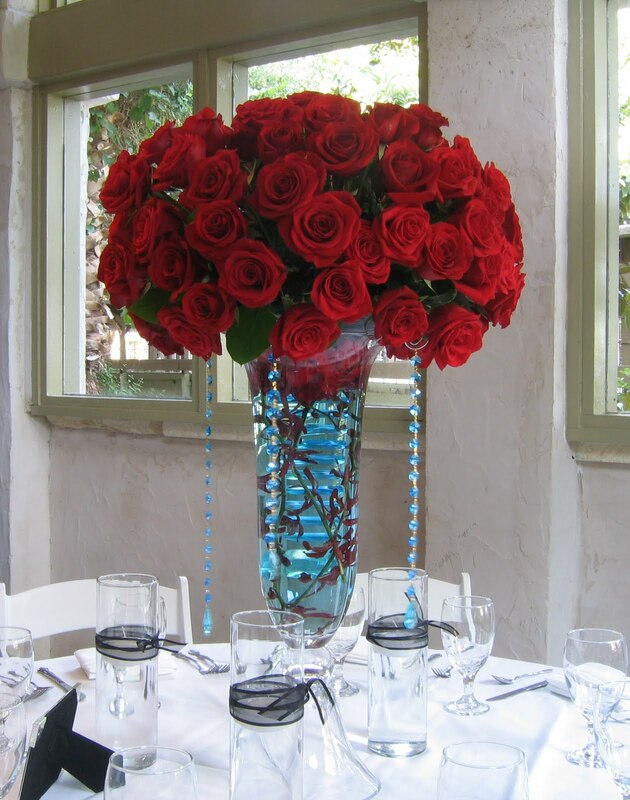 The vase of this arrangement was accented with red spray orchids, red petals and light blue water. The blue was further picked up by the blue crystal drops hanging from each of the tall vases. The table was lit by three tall cylinders, each with a black ribbon and floating white votive. The second arrangement was of medium height with a green leaf, black ribbon and topped with an arrangement of red roses. The final arrangement was similar in nature, but in a square vase. 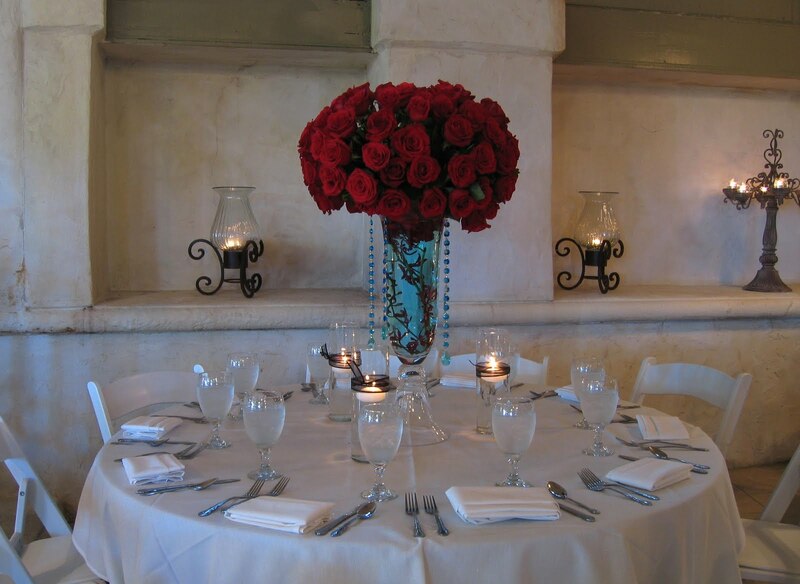 All tables were accented with sparkling votives. 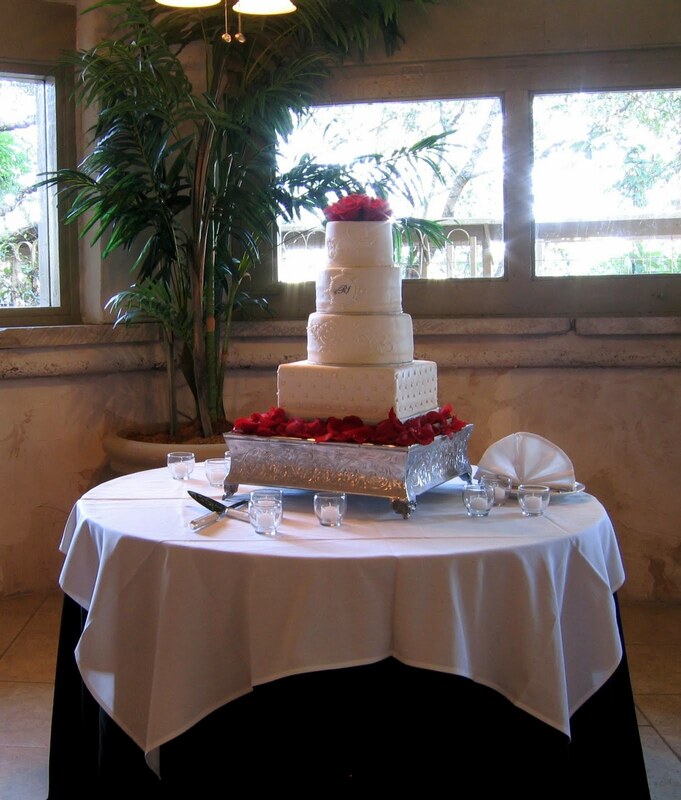 The cake table complemented the decor. A Study in Classic Tiffany & White.